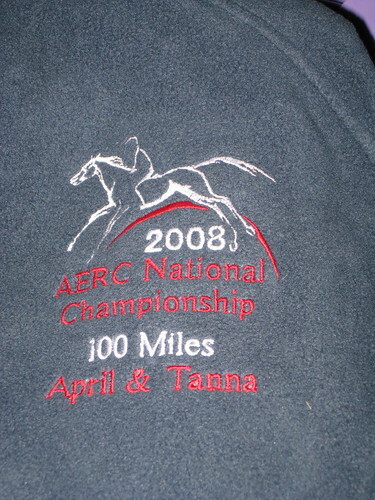 My National Championship completion award was a very nice zippered fleece jacket with the NC 2008 logo on it. I really liked it, but wanted to add an additional touch. So I took my jacket to Sew What?, a local sewing shop and asked them to add a couple lines. I got the jacket today and I think it turned out great! A bargain at $13. What a great idea!! I might have to steal that when Aaruba and I finish our first 100. :-) Your jacket looks awesome. 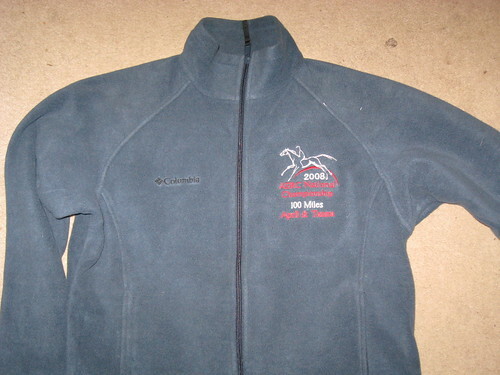 When I did my first 50, I really wanted a t-shirt, but the ride gave out mugs as completion awards. That was all very well and good, but I wanted that t-shirt! So I had one made up with a gorgeous Arabian head on it and the details of our ride (ride name, date, distance). And then on the back my name and Tanna's name. It turned out very nicely and I really like it. Congrats on your ride completion - looks like a nice award that you'll get a lot of use out of! Good luck with your upcoming ride season.